Lisa Dillin, Joshua Haycraft, Annette Isham + Zac Willis and Sarah Knobel in room 225 at Aqua Art Miami 2013. The artworks, which include sculpture, video, photography and installation, all share a futuristic theme. Lisa Dillin’s sleek, sculptural works made from linoleum, wood and mirrored glass illuminate the discrepancy between manmade objects and the natural world. In Dillin’s highly designed environment, floor tiles double as exotic animal pelts and the leaves of well-kept plants are constructed out of digital prints. Joshua Haycraft introduces audiences to BHBITB, a fantasy culture complete with its own government and religion. 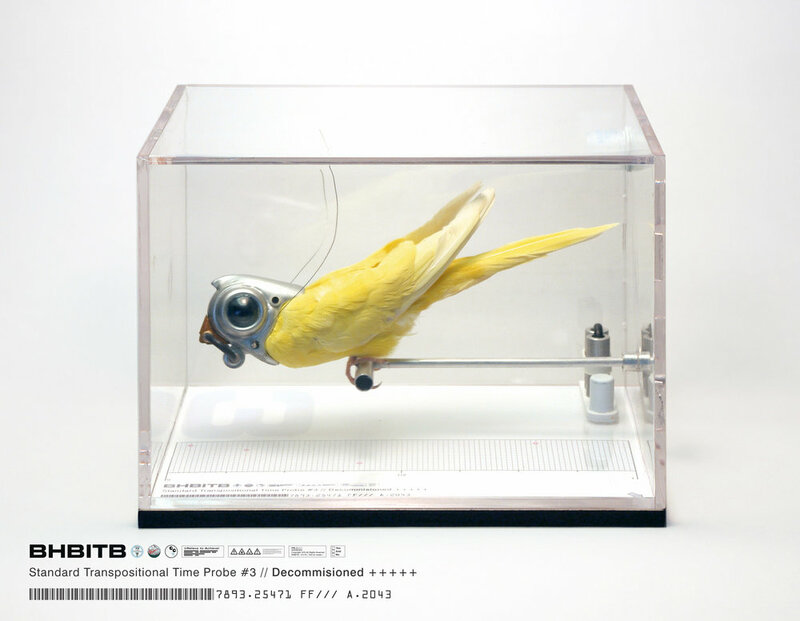 Beginning with a display featuring a canary that has been sent to retrieve information from the future, Haycraft’s sculptures, videos and objects describe in meticulous detail the culture and way of life in BHBITB. Sarah Knobel’s Icescapephotos will immerse viewers in mysterious landscapes created out of dollar store purchases suspended in ice: in her compositions synthetic materials metamorphosize into mysterious organic-looking worlds. Collaborative duo Annette Isham and Zac Willis will transform room 225’s bathroom into a self-esteem boosting experience in Bathroom Whispers , a sound installation that offers flattery and compliments as participants use the hotel room’s facilities.